Starting an eCommerce Business with your own Website has never been as easy as it is now. With the boom in the Indian eCommerce Industry, it is becoming more and more easier to start your own online business. Now startups have a large number of options for payment gateways, courier services, product photographers, and yes even website development companies. Now even with a small but adequate budget anyone can get their online business started within 45 days. So, here’s our short tutorial on how to start your own eCommerce Business on your own website. You want to sell a commodity (not a service) online on your own website. 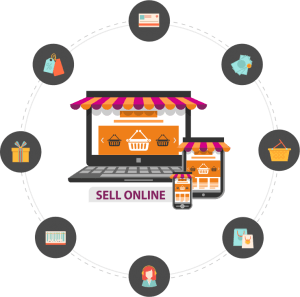 Your project’s scope is limited to the basic functionalities of an eCommerce Website. Of course! for selling online in India, your business must be a registered one (with state or central government). Otherwise you will not be able to collaborate with any Payment Gateway or a Courier Company. Your business could be of any type whether a proprietorship, a Private Limited Company, Partnership, LLP, Public Limited Company, One Person Company, etc. For a layman out there, most of the ecommerce startups are either Private Limited Companies or a Proprietorship. Though you better consult your Chartered Accountant for which form of business you should go for. But for just a not that expert an advice (we are only Developers not CA’s) for startups, if you have good funding and are confident that your idea would be successful then go for a Private Limited Company. An if your initial investment is limited and you are not sure whether the concept will be a viral success then even a Proprietorship or Partnership will do just fine. But I will again strongly advice, CONSULT YOUR CA. To sell any commodity online you need a Sales Tax Registration, also called VAT (will soon become GST). Until the GST Bill is not implemented which is expected by April 2017, the VAT registration is done at the level of state government. So you need to get a VAT registration from the Department of Trade & Tax of your state government. Some specific products can also require certain other registrations. For example selling food food online requires FSSAI registration (from central government). Again, only you CA can tell what all registrations you might need. Step 1 : Choose a good domain name. OK! so for a laymen, a Domain Name is the name of the website that appears in the address bar of your browser (chrome, firefox, or internet explorer). Like “example.com” is a domain name. Where “.com” is its TLD (top level domain) and the word “example” is its SLD (second level domain). For an eCommerce Website a preferred TLD would be “.com” or a “.in”. Remember that “.co.in” is not that preferred a TLD. Choosing a right domain name can be the most hectic task though. Because most of them would not be available. Either someone has already taken your favorite domain name or it is selling for too high. Here is one of the many websites where you can check availability of domain names: https://in.godaddy.com/. Godaddy is a good company to buy a domain name (but not for buying hosting). A domain name should cost you not more than Rs.700/- and you can easily find (on google) a coupon code that will decrease its price to Rs.150/- or less. It after searching for the domain name price turns out to be more than that then it means that someone has already bought this domain name and is reselling it to you through Godaddy. Now this is a step you can complete even before you pay the advance to your website designing company. Choosing the right domain name can take a while. So, while you are thinking upon the quotes of different website designing companies, your domain name should be chosen. Remember, very few developers would start their work on your project without a decided domain name. Keep the domain name catchy and memorable. Use your imagination. If you are planning to sell to a specific region or state rather than the whole country then it would be helpful (in something called SEO) if you include the name of that region or state in the domain name. Step 2 : Find a good Website Designing Company. Firstly websites are not only designed, but are designed and developed too. Designing is done by professional Graphic Designers to just create the look and feel of the website. Then comes the task of a Software Developer who actually converts the design into a real website. Since developers task is the most critical and time taking, so, when I write the word “developer” in this article from here on, I would actually mean the whole Website Development Company. Finding the right Website Designing & Development Company can take a while. Pricing in the services industry depend upon how many people, taking how much salary, work for how much time on a project. So, your developer should be able to justify his pricing by explaining you the work involved. Also development time of an eCommerce Website with basic features should not at all take more than 30 to 45 days. The process of Website Development though cannot be don’t by anyone but a trained and experienced developer, but a layman can always understand the relevance of all the components and steps of the process of Website Designing & Development. So, try choosing a developer who is honest, answers all your questions, and does not intimidate you with complicated hi-tech words. This is a serious advice. Imagine if you want to accept online payment from any banks net-banking or credit/debit cards. Then there are two options for you, either collaborate will every nationalized bank in India. Or a lot sane option is to collaborate with a third party which is a Payment Gateway Company. The Payment Gateway Company already has collaborated with all the Nationalized banks already. Choosing the right Payment Gateway should not be that tough though. There are already some big players in this area that provides services with a very low commission. Some of the big players are CCAvenue, PayUBiz, PayTM, EBS, Citrus, PayUMoney (recommended as a backup Payment Gateway), etc. Payment gateways these days charge about 2% (+ service tax) as a commission for each transaction amount. This already includes the transaction processing fee of the Banks. Remember to choose at least 2 different Payment Gateways, so, that in an unforeseen case if you get into a dispute with one Payment Gateway you can quickly switch to the other. Also, integrating the payment gateway with your website will be done by your developer. In fact payment gateway integration can be done even before your collaboration with the payment gateway is complete. This is because most payment gateways give you a nodal account a day (or two) after you apply for it. This nodal account can even receive money but that money cannot be withdrawn to you r bank account until you send some documentation to them (this includes an agreement) to complete the collaboration. Also, there is something called Sandboxed Payment Gateway, this is a fake payment gateway created just to check the payment gateway integration until you actually launch the website into “production mode” (start selling). Until then the website is considered to be in “development mode”. In fact it will be better if your developer applies for the payment gateways (most of them do) after you choose which ones to apply for. Then while the website is being developed you can send the required documents to the payment gateway company. Then when the integration is complete, you have tested the integration, your documentation has been accepted. and the website is to be launched, then you can change the password of your payment gateway account. Applying for a payment gateway does not require for the development of the website to be complete. In fact it can be applied for as soon as a simple visible structure of the website is complete with some dummy product for sale. Step 5 : Complete collaboration with the Courier Service. Now this is something in which your developer can help you the least. At most he can suggest you some good Courier Companies or give you a list of them. payment gateway companies don’t entertain developers much (except for something called API Integration), and they like to communicate directly with the company which will be using their companies. What is the weight & Size of your product? Whether it needs insurance or not? How fast delivery do you need? Whether you will do the packaging yourself or do you need a courier who can do it for you? Integration of the API’s of the courier service with the website will be done by your developer though. these API will allow your customers to track their shipments directly from your website instead the website of the courier company. Step 6 : Get the product photography done by professionals. We all love to try try our photography skills here. But do not do it yourself. There are just too many factors involved in photography for everyone to be expert at it. You might find some tutorials online for DIY product photography. But the truth is that you can’t be as good as a professional product photographer. Remember, the images of your product will actually be the first visual impression that the customer will see. Customer usually look at a lot many images of different products before looking at specification of a single one. Product photography can cost you anywhere from Rs.60/- to Rs.250/- per product. A suggestion: don’t go for the cheapest photographers the price difference becomes negligible when you see the difference in the quality of photography of good photographers. For some product’s, photography with models becomes an obvious requirement, but that will of course cost you event more. Step 7 : Testing with few products. By he time website is being developed by the developer, you should be able to complete product photography and collaborations with the payment gateway & courier company. When the website is completely built, you should completely test it for 2 to 4 days and see if there are some critical errors or required changes. Step 8 : Complete the Data Entry of all products. Step 9 : Start your SEO and Digital Marketing. There is no advantage of selling online if you are not selling to masses. For, that you need to get famous online. SEO & Digital Marketing are two ways of doing just that. OK, now, “what is SEO and Digital Marketing” is a completely different story. Both will probably need completely new articles articles to be understood completely. Until then, for the layman, here are some simple explanations. Indexing your website on search engines. This is more complex than just registering a new account. Having content on your website that people want to read and are searching for (Most Important). Getting some special code called metadata & microdata into your website. These codes let search engines understand what your webpages are about. Making more and more websites have links to your website. Making more and more links on your website to other relevant websites. Getting famous on Social Media. Doing email & SMS marketing. Unlike SEO, digital marketing is paid advertisement. You pay google, facebook, twitter, linkedin, and some other platforms to show your ads. This is a whole lot of a different story. I know you desperately want to know how much it will cost. For now you should know that in India it is the safest bet to start your Digital Marketing campaign with a single platform at firs, which is google search. And then move on to other platforms also with time. Initially you should have a budget of Rs.10,000/- per month for marketing on each platform. Start with google and move to others while strongly observing the response. You should look for a developer who can do SEO & Digital Marketing also. Many times to be successful in these campaigns you will need to modify the code of your website. And who can do it better than a developer? Both SEO & Digital marketing campaigns should be based on strong research of your online competitors and the online market. A good SEO analyst will always also be an expert in doing this research and should show you reports of his research before marketing. Digital Marketing is something that costs you money. So, a sensible marketing expert would never spend his clients money without explaining him what he is going to do. You and your developer, both are together in this game. Step 10 : Start making money through online sales. So, if you have done everything right, you should be making money now. It will always be a slow start. But an interesting idea never takes too long time to be viral. Having a website infrastructure is just one aspect of a business, delivery is another. If your service is not good enough, your products are mediocre, or your pricing is not competitive, then don’t expect your idea to viral any sooner. Can help you the most in Payment Gateway Integration, choosing the right Courier Company and choosing the right Product Photographer. Can move your website into production within 45 days. Is willing to share the insights of the whole process with you in layman terms. Starting a new business can always need a lot of investment and hard work. But, comparatively an eCommerce Business requires very less investment and infrastructure than an offline business. So, even if you think your idea is a bit of risky, it is definitely worth trying. And with the kind of eCommerce Boom that is going on in this country right now, it is either now or never. Still thinking?, your competitors might have even started working on their eCommerce plan. So, start working on your own plans and go for it!